Have a look at some of the educational and fun things we do! October 2014 brought some very funny and strange looking creatures to our classroom, it was hard to know if we had come to the correct place or not!!!! From little acorns grow mighty oaks! Our first project this year was on Irish Mammals. Our report included: a description of the chosen mammal, habitat, diet and other interesting facts or anecdotes. On Tues 3rd June, 3rd & 4th Class went to Dublin on their school tour. First stop was The National Museum where we had a guided tour of The Viking Exhibition. We also saw the Tara Brooch and Ardagh Chalice. Our next visit was to The National History Museum. Upstairs we saw all the wild animals and marsupials. On the ground floor we saw all the irish mammals, butterflies and moths. Our final stop was to Roll and Bowl in Portlaoise, a great day was had by all. 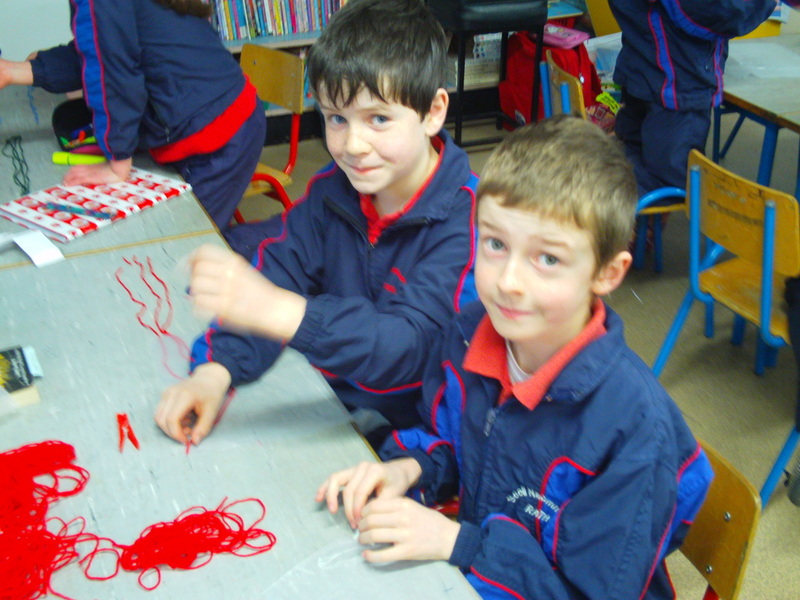 3rd & 4th class pupils love lego. Take a look at some of their constructions. We had our 2014 Sports Day on Thursday 19th June. it was action packed and we really enjoyed the day. Have a look at some of the action!! In history we studied The Stone Age Period. During our art class we used three colours to recreate some stone age art. We studied all about electricity and how it works we had great fun making a circuit board. We planted Acorn and Horse Chestnut seeds. Santa in Rath - see if you can name them all !!!! 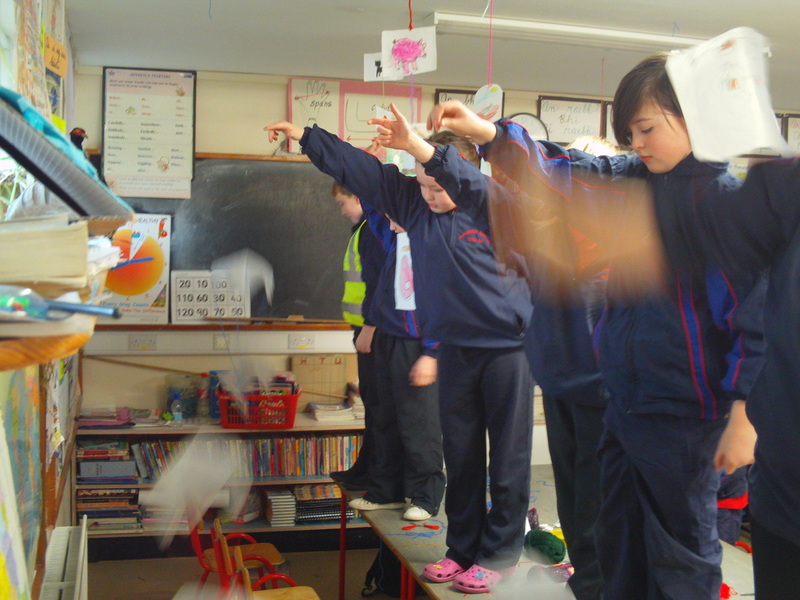 Recently we did a very interesting lesson on Forces in Science. 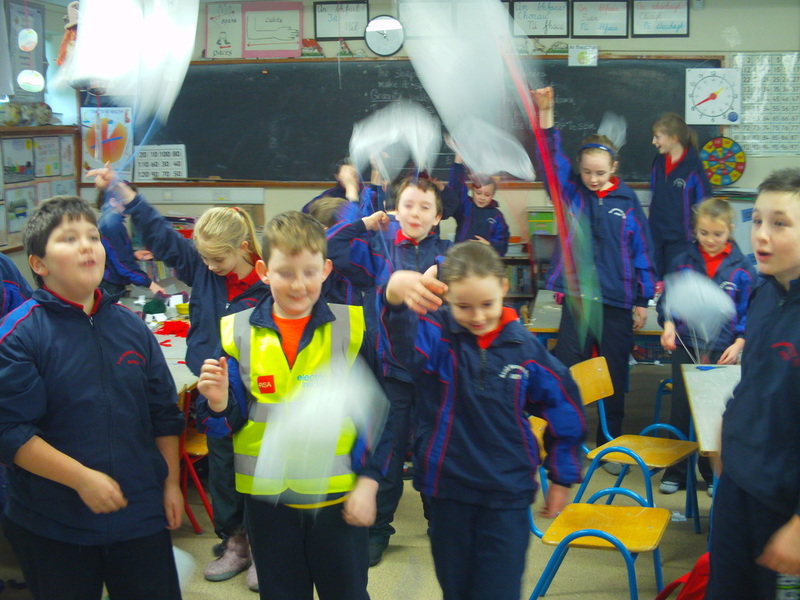 We designed our own parachutes using plastic bags and string. We had lots of fun dropping the parachutes from a height and watching them glide to the ground below. Have a look at our results. The recycling project 3rd and 4th had to construct and design an object of choice using only waste materials. Cardboard, plastic bottles, milk containers, plastic, old socks, buttons and lids were some of the materials used in construction. As a follow up activity the children were asked to write a procedural account ......listing the materials and showing the steps for making and doing. Enjoy the show.